Who doesn’t love Chicken Soup? If you have left over turkey or roasted chicken, why not make a soup? Or perhaps you want to make a soup 100% from scratch? Do you want it weeknight fast or entirely homemade (weekend slow)? Lets go the fast route first. Chicken Broth/Stock, Not bouillon. What is the difference.. flavor. Chicken stock is hearty liquid produced by simmering chicken bones, root vegetables, herbs, seasonings in gallons of water over a long period. The result is a nice clear-ish broth. Skim the fat and limit the salt and you have a very healthy flavoring. And it freezes well. Homemade stock is the best, however, there are very good canned low sodium/fat broths/stocks in the super market. You will notice, I always chose the lower sodium products as then you have control over the salt content. I find those with added/regular salt tend to get too salty.. This includes butter. Bouillon is more of a flavored salt.. similar to the packet you find in Raman noodles. You add water, it does impart a flavor, but not a real flavor and tends to be on the salty side.. especially if you reduce the liquid. Enough said… use broth, stock from a can or homemade for soups. Bouillon has its place, but not in a great soup. The time saver here is your chicken and stock are already done and supermarkets sell the core ingredients already diced for you in the pre-packaged salad area of your produce section. This makes it even faster. Quality does suffer a bit once a veggie has been cut. but cooking is what is important to start. If you have time, by all means, buy them whole and cut them yourself. But NO shame in taking advantage of the super market short cuts! In a large Sauce Pan (at least 6 qts), add oil and heat to med-high heat – about 1.5 minutes. Add Carrots, Celery and onion, sauté for 5 minutes stirring occasionally. Allow the ingredients to caramelize (turn slightly brown), keep stirring to avoid burning. The brown will impart the rich flavors of the veggies. a few minutes longer until a nice rich brown on the carrots and onions. If turning brown or beginning to burn, turn the heat down, you can add a touch more oil. Add garlic, potatoes and chicken (and other optional veggies). Saute another 3+ minutes, stirring often. Finally add 2 cups of broth, this will loosen all the bits on the bottom of the pan, stir to merge. Taste. Do you need more salt? more Pepper? now is the time to adjust seasoning.. If too strong, add water. Let simmer until potatoes are done – about 15 – 20 minutes. If weak flavoring – simmer longer to allow the liquid to reduce which intensifies the flavor. Resist the desire to add too much salt at the beginning, as salt intensifies as liquid is reduced and longer cooking. Add cooked egg noodles, spaghetti, or other pasta. This can cook in the time it take to do Steps 1 – 5. What if you want to use the method above, but have raw chicken? No problem. Your time can increase by as much as 60 – 90 minutes, as you need to cook the chicken first. Sprinkle the rub over all the pieces, both sides, place on baking sheet with sides (fat from skin will release so you need a pan that can catch it). Let sit until the oven is ready. Bake at 425 until done.. approx. 30 – 45 minutes depending on thickness and type of chicken pieces. They are done when pierced with a fork or knife and the juices run clear. Remove from oven and let sit for a good 15+ minutes to cool down. This will allow the juices to redistribute into the meat (which you want to then release when you make the soup). Then break apart, dice or shred as desired and follow the recipe above. Add the bones starting at Step 1, discard the skin or use (if not too salty or overly herbed) starting at step 1, but remove both skin and bones before serving. Keep in mind, you will want to skim the surface of the soup to remove the added fat. Prepare for a full days cooking. Take your chicken (assuming its a whole chicken) and prepare using the rub described above for the chicken pieces. Cook at temperature and time according to the package instructions. Let cook at least 30 minutes for a whole chicken. Carve and remove as much meat as you can (of course you can sample the chicken all you want). Hint: if using dried herbs, use a mesh tea strainer to allow the herbs to infuse the flavor, but not “muddy” the waters. Also crush the herbs with your fingers before placing in the liquid. Exception is bay leaf, no need to crush it, but you can break it into thirds. Get out the biggest deep sauce pan you have, preferably one that can handle at least 6 quarts or more. Add the olive oil and heat over med – med-high heat. You may need to adjust and re-adjust over the next few steps to obtain your desired results.. all is good. Add the carrots, celery, onions, bones a pinch of salt and a few twists of pepper. Let simmer and begin to caramelize. Add herbs, garlic and leeks (these are added later as they can burn faster than the other root veggies). Continue to caramelize and infuse flavors for about 3 – 5 minutes. If you are concerned about burning – you can adjust the heat to lower and/or add about a 1/2 cup of water at a time as needed. Not too much as you don’t want to steam them. You are looking for nice color on the root veggies and herbs and the bones to release and open as this is where the flavor comes from. When the carrots look like they have a very nice coating of caramel, add the water. Luke warm or room temp. The water should be enough to cover everything over flow it by at least 2 inches. If your pot can not handle that – fill it as high as you can and be prepared to add more water as it evaporates. Once the water begins to simmer, lower the heat to keep it at a steady simmer.. bot boiling and spurting, but little bubbles. Keep this going for at a minimum of 2 hours. You will know you are done simmering when you try a piece of chicken that was left on the carcass and it has no flavor. Now you can be certain you have extracted all the flavor from the chicken. Taste the broth. Still watery – no problem.. I expect this. Now you can increase the heat slightly and allow the liquid to reduce (do not add any more water). You still do not want it to boil, but it can simmer more rapidly. This will allow the water to evaporate and the flavors to intensify. As the liquid starts to evaporate, taste. Once you get the chicken flavor you desire or close to it, adjust your salt. Again, don’t go crazy with the salt, as you can freeze this for uses in other dishes and like buying chicken stock, you don’t want the salt until you have the final product/dish. When you have it they way you want it – get out your largest strainer, put it over a large bowl or other pot to catch the broth you worked so hard on, and strain all the stuff out. Throw out or compost what is in the strainer. It no longer has any culinary value as that value is now in the golden liquid you have in the bowl below. 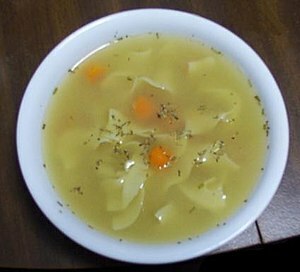 To continue – follow the first recipe: Making Soup from leftover Chicken (Turkey) You will now be able to use your homemade stock. Last Note: Homemade stock may not behave the same as your out of the can stock in that when you make stock from bones (the only way), the natural gelatins in the bones release. So when homemade stock cools and is refrigerated, it may take on a thick gelatin consistency. This is fine and great as you know you extracted the most flavor possible.. As soon as you heat it, it will become liquid again. Posted by culinaryease on November 29, 2010 in General Cooking, Recipes and tagged Carrot, Celery, chickensoup, Soup, Stock (food). Your supplement of raw chicken and roasting instructions…right on! Thank you. Gotta go shop. I think My Fair Lady will go well with the cooking, but I’m saving Dark Water for the meal. Ha!Ha! I love the simplicity and eye-appealing pages. I just simmered some chicken broth from a leftover carcass and plan on making the soup recipe. Thanks! I’ll definitely keep an eye on this. I also posted this to my FB page. Glad you are using your passion.